CDT Audiophile Grade BM-car specific direct fit easy upgrade component kits are suitable for BMW best selling models: 1 Series, 3 Series, 5 Series and so on. 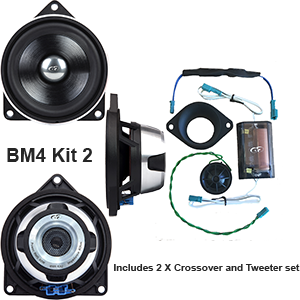 The speaker and tweeter fit into the factory location and use the factory connectors, you will enjoy the strongly improved sound quality with the CDT Audio BMW sound system upgrade. Using factory harness and connectors to allow plug & play. 4” mid-range designed in a cast aluminum construction for ultimate durability and ultimate performance. 4” -mid-woofer made from biological fiber cone for authentic and brilliant sound reproduction. Tweeter integrated phase plug for better dispersion. 4” woofer w/butyl rubber edge.